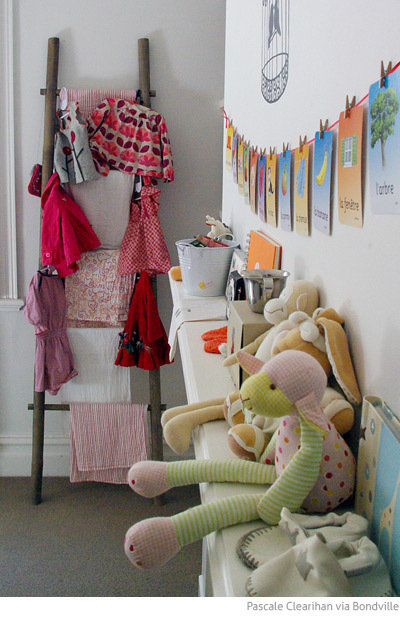 Bondville: Real Kids Room: Spoonful of Colour playroom and shared girls bedroom.. and giveaway! 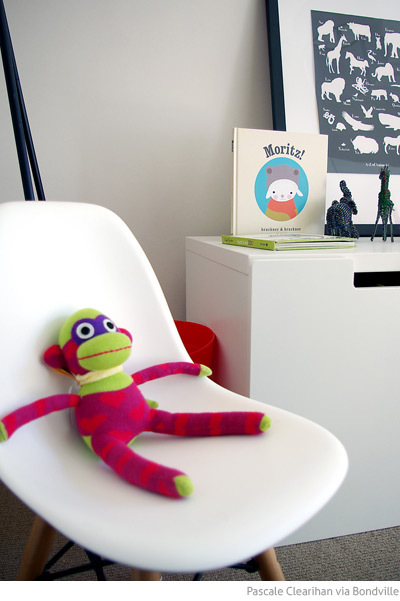 Real Kids Room: Spoonful of Colour playroom and shared girls bedroom.. and giveaway! 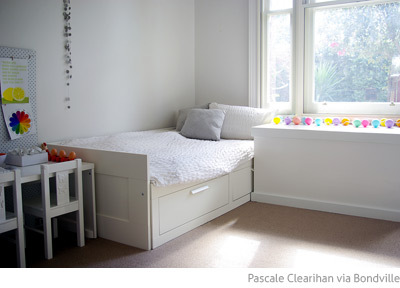 I adore the white-with-pops-of-colour look that Melbourne graphic designer, paper product designer, all-round crafty gal and blogger Pascale Clearihan of Spoonful of Colour has pulled together for her girls' playroom and shared bedroom. 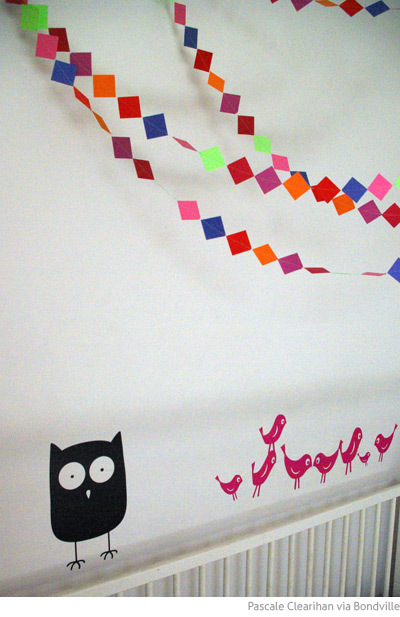 Pascale has included many of her own handmade decorations and artwork in her childrens' rooms. 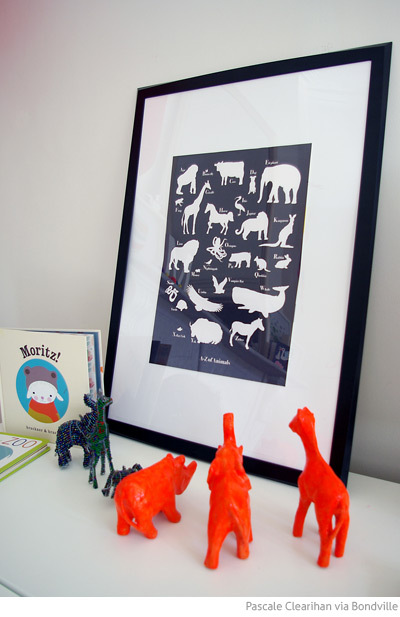 The stand-out A-Z Animal Print below is one of Pascale's own (you can find it in the Spoonful of Colour online store). 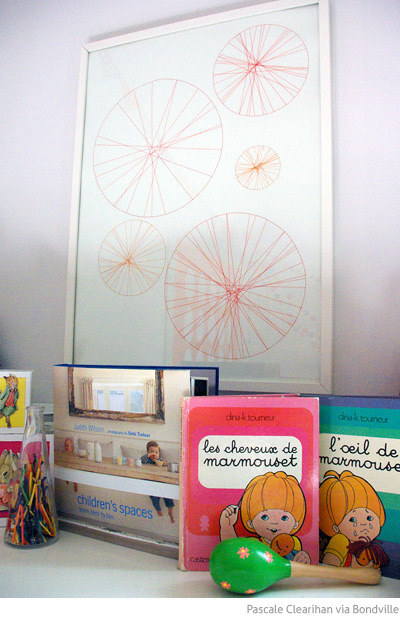 I'm thrilled that Pascale is giving away one A3 print to a lucky Bondville reader! (giveaway now closed). See the end of this post for details. Enjoy this tour! Can you imagine how excited you would be to have this playroom? Pascale's daughter's computer is better than mine! 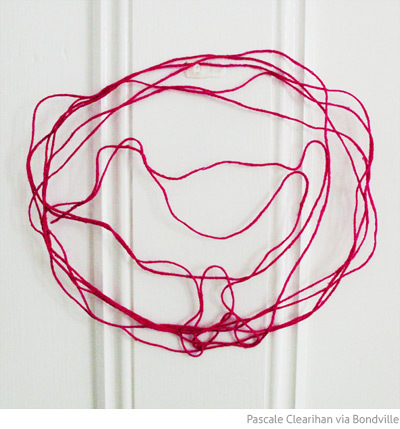 The red elements are invigorating and the handmade wire welcome sign is whimsical and so on-trend. You really can't go wrong with a base of neutrals and splashes of colour. Note the neon orange papier mache animals; clever Pascale painted these animals to add a fun (and current) pop. You could do the same with plastic toys - put large painted plastic toys on display and fill a jar with smaller ones - or make a fun mobile. I also love the treatment of the ornamental fireplace - the chunky birch logs and colourful rug give the fireplace a sense of purpose. Paper Light Strand: Bonjour, Middle Park, VIC. 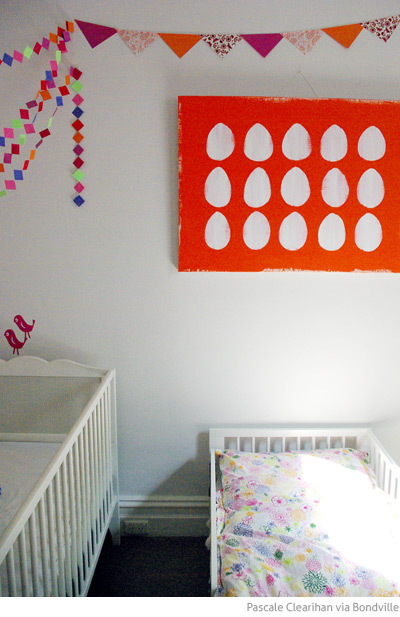 Pascale uses pops of fuchsia pink and orange against a neutral base in her girls' shared bedroom. 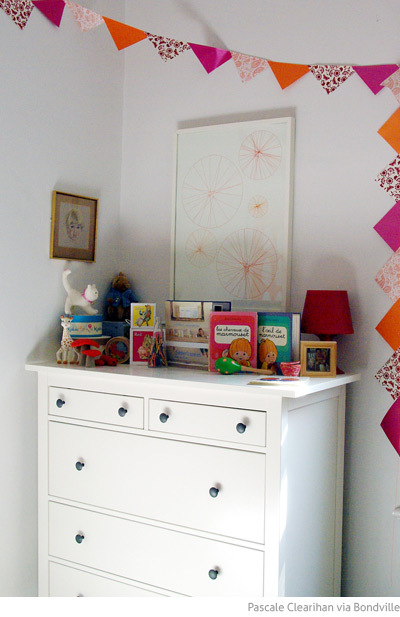 Handmade bunting and paper garlands provide interest against white walls and Pascale's own orange wheel artwork extends the height of the drawers. 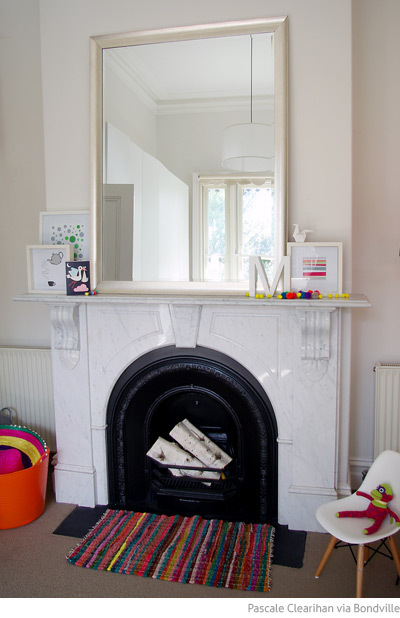 Again the fireplace is a real feature of the bedroom and the perfect place for a stuffed toy collection to rest, framed by the French flash cards pegged to ribbon. 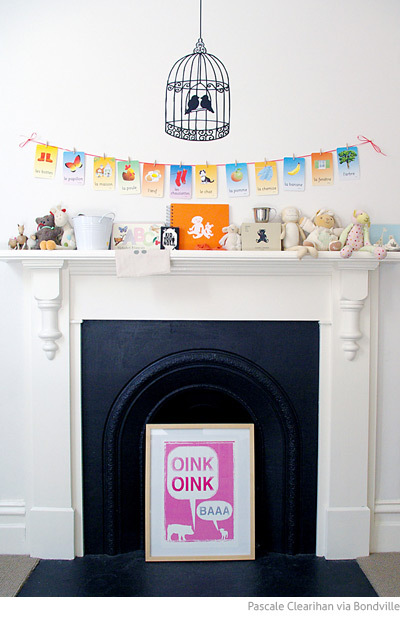 And how cute is that pig and lamb print (by Pascale of course)! 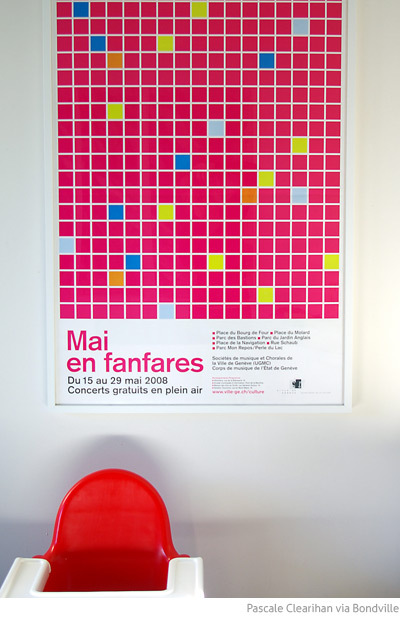 Framed French Concert Poster: from the side of a bus in Geneva, Switzerland! If you would like to win an A3 A-Z Animal print by Pascale, simply comment below with your favourite How-To project from the Spoonful of Colour Facebook Page by Friday 28th September 2012. 1. This is a game of skill. 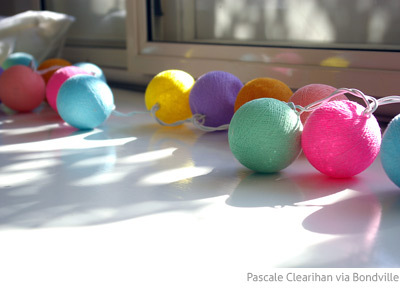 Entry via comment on this post with your favourite How-To project from the Spoonful of Colour Facebook Page. 3. The winner of the giveaway will be chosen by Pascale Clearihan based on the most original answer. 4. This giveaway is open to all Bondville readers in Australia and internationally. 5. This giveaway is hosted by Steph Bond-Hutkin via the Bondville blog at blog.stephbond.com. 6. The prizes consists of one A-Z Animal Print RRP $30.00 plus postage from Spoonful of Colour. 7. The giveaway opens on Friday 21st September and closes midnight on Friday 28th September 2012. 8. The giveaway winner will be announced on Bondville on Saturday 29th September 2012. I love the "How to Make Your Own Fortune" project. I have to admit that the "Happy Wife Happy Life" fortune really caught my eye. Too true! The wire typographic wall hanging. Just the how-to I need right now, as we're creating a "drop zone" at the entry of our house (you know the place where you drop your bag, shoes, keys and phone bills) and all it needs now is a pop of colour on the wall. Imagine a cheery "welcome home" after a hard day at the coal face....lovely. I love the important things mobile - just beautiful words and concepts to make you reflect and smile. Also love the how to earrings. Congratulations @Liz! You are our winner. Can you please email me at stephbond at gmail dot com and I can arrange for your prize to be sent to you.